Professor Reuben A. Alabi, IWIM's Alexander von Humboldt Research Scholar, has published an important study on the Impact of Agricultural Foreign Aid on Agricultural Growth in Sub-Saharan Africa. The study was facilitated by the international think tank IFPRI (working on agriculture and food security in developing countries and being located in Washington D. C.) and was published by AGRODEP (African Growth & Development Policy modelling consortium). The study investigates the impact of foreign agricultural aid on agricultural GDP and on productivity in Sub-Saharan Africa (SSA). Using secondary data regarding foreign agricultural aid, agricultural GDP and productivity indicators from 47 SSA countries, spanning the period 2002-2010 and employing a Generalized Method of Moments (GMM) framework, the study reveals that foreign agricultural aid has a positive and significant impact on agricultural GDP and on agricultural productivity. There is also an impact of disasters and conflicts in Africa on aid receipts, a finding which implies that foreign agricultural aid responds to disasters and conflicts in the SSA region. The paper is downloadable (online access at http://www.agrodep.org/sites/default/files/AGRODEPWP0006.pdf ; see also the PDF of the study). 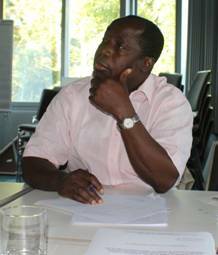 Professor Alabi is also preparing a paper on foreign aid to Africa's agriculture for IWIM's Blue Series Discussion Papers (Link to http://www.iwim.uni-bremen.de/publikationen/pub-blue.htm ). Various of his former studies produced at IWIM in Bremen are available in the Blue Series Discussion Papers. Professor Alabi was recently invited to attend the high-level event German  African Cooperation in Education and Research/Africa Days of the BMBF (Bundesministerium für Bildung und Forschung/Federal Ministry of Education and Research) which took place in Berlin in March 2014 (see the Programme of the event as a PDF). Economics Professor Karl Wohlmuth and Agricultural Economics Professor Reuben A. Alabi prepare a research and development project on Solid Waste Management in Nigeria for environmental protection and production uses, with lessons derived from Germany's policies in this regard. Nigeria can learn a lot from the solid waste recycling policies in Germany and from the innovative recycling firms' activities in Germany. Professor Dr. Alabi is soon ending his research visit to IWIM, University of Bremen after a stay of three months financed by a Senior Research Fellowship by the Alexander von Humboldt-Foundation. Further researches are planned for the year 2013 in cooperation with Professor Karl Wohlmuth (see the Report by Professor Alabi and some of his already published studies to be accessed in the Blue Series Discussion Papers of IWIM). A study on An Analysis of the Impact of Foreign Aid on Nigeria: A Dynamic Specification is under Review and will then also be published in the Blue Series Discussion Papers of IWIM.